Digital signages are replacing the legacy advertisement channels, such as printed ads by displaying attention-grabbing multimedia content. These large-sized digital signages are currently used to capture the attention of visitors, engage with them in-store by playing relevant videos, and provide information about the product – colour choices, reviews and social media mentions. Not only does it act as a product expert but also implements endless aisle specific applications, such as select and buy, check the availability of the product in the aisle and more. Owing to the great customer engagement, global digital signage market is consistently growing at a CAGR of 7.9% and sales revenue is projected to increase to $24 billion by 2020. However, modern retailers demand much more from marketing campaigns. They also need to measure the impact of a digital signage. This is important to monitor the effectiveness of a campaign and to optimise the number of sales associates in-store. Bluetooth beacons add that extra layer of campaign intelligence required. In this blog post, we will talk about why beacons and digital signages are a power couple and ways in which beacons enhance the impact of digital signage, and help in monitoring the effectiveness. Beacons are Bluetooth transmitters that can push notifications to the Android and iOS devices in proximity, without an app. Beacons are used by businesses for various purposes like proximity marketing, indoor navigation, asset tracking, proximity payments etc. Retail has been one of the earliest adopters of beacon technology and it continues to grow in terms of the use-cases and deployments. 75% of the retailers in the U.S. were already using beacons in Q4 2017. Why is it profitable to use beacons in digital signages? Despite attracting customers with appealing content, digital signages have certain limitations like being bluntly generic and non-personalisable. Also, it is not possible to measure the performance of the ads displayed. This is why businesses integrate beacons and digital signages using Bluetooth. With beacons, it is possible for businesses to measure the performance of every digital signage. Beacon analytics can give useful information like the number of impressions, click-through rates, least and most performing ads etc. Beacon technology also makes it possible for customers to choose what they see by using their smartphone like a remote to your digital signages. Joining hands with a successful technology like beacon that is growing at a CAGR of 95.3%, the anticipated success of the digital signage seems to be promising. Display information about special discounts for loyal customers encouraging them to buy more. Send the same information to the customer’s phone to make sure that the message gets delivered even if the signages miss the customer’s notice. NEORIS uses beacons in their customer loyalty cards to enhance the in-store shopping experience. When a customer walks into the store, the digital signages would show her suggestions based on her wishlist and purchase history. The touch-sensitive screen enables the user to add the item to the cart, suggest it to friends or even share it on social media. This doesn’t even require the user to take out her phone. ‘Lift and learn’ is a technology that educates the customer about every product that she picks from the shelf. It could be a video tutorial playing on the signage or a stepwise guide to using the product. This is done by attaching beacons to every product and adjusting their range in such a way that they talk to the digital signages when they are taken out of the shelves. Scala is one of the successful retailers that has implemented the lift and learn concept using Bluetooth beacons. As soon as the customer picks up a product, the digital signage right in front of her displays the product information. If they pick two products at once, it shows them a comparison of both the products. This comparative analysis helps customers make faster and better decisions. Integrating beacons with your app and your in-store digital signage system is like giving your customers the remote control. According to a press release by Digital Signage Today that talks about the future of beacons, it will be possible for the customers to decide what they want to see on the digital signages. This can be done by pairing your smartphone with the Smart TV. You can use beacons to push notifications to a customer’s phone to announce this experience. But, this doesn’t make them ignore the information that you want to convey. You can segment your screen into sections and use the extra sections to feature information like product launches, special offers, RSS feeds, social media feeds, related products etc. Retail stores can integrate beacons with their app to send customers personalised notifications based on their purchase history. This gets more interesting when you involve your digital signages in this system. When customers approach a product, beacons will push a notification about that particular product to the user’s phone. They can swipe up their phone’s screen to fling that product to the large display and get more information. Scala is currently using this technology in their retail stores. Beacons in synergy with digital signages can help customers get all the necessary information without the help of a salesperson. 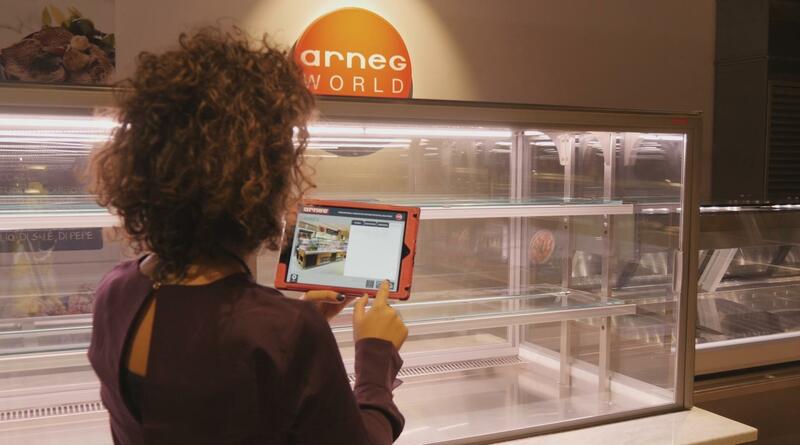 The displays in the ARNEG World’s showrooms are one of the successful businesses that use the beacon and digital signage power couple to enhance the customer experience. The Touch sensitive digital displays can provide product information, data about the stock, indoor navigation and much more. The displays standout not only for their design but for their efficiency and ergonomics too. As a compliment to the big digital signages, customers are also provided with tablets. Beacons send interactive messages to the tablet identifying the points of interest and encouraging the user to read information about the product. Beacons witness the fastest adoption in the retail sector which means most of your competitors are already using beacons. Integrating beacons in your digital signages is one of the best ways to outstand your competitors. Given the low cost and the ease of maintenance, beacons are worth giving a try. “Detect when a customer picks a product and display information about that product”. Scala provides retailers with several digital signage options. Lift and Learn is the name of this particular technology. The products have RFID attached to them and that’s how the Connected systems know that a certain product has been picked up and the LCD screen shows the features of the product. When two products are picked up at once, a comparison is shown on the LCD screen. In case of products that have screens like smartphones or tablets. you will also be able to see the features once you pick up the product.